Looking for some enjoyable real money UK slots? 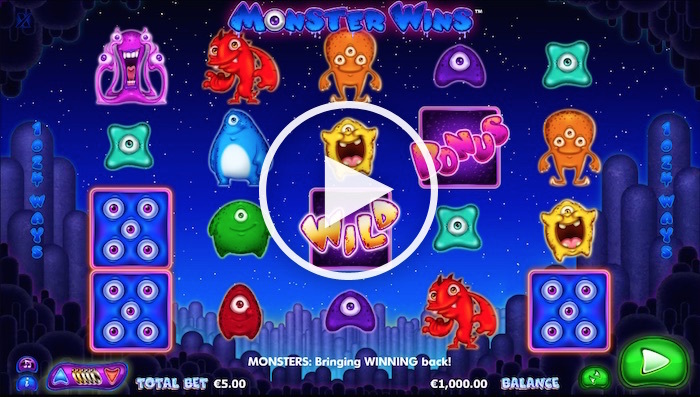 We’ve found a great one in the form of the new Monster Wins slot from NextGen Gaming. Yes, this game has a good pedigree in coming from that software developer, but what else does it have to offer? Well, we’re sure you’re going to have a monster good time if nothing else! The Monster Wins NextGen Gaming online slot is a 5 x 4 game with no paylines – instead it goes for the 1,024 ways to win format. Don’t let the mention of monsters put you off either – these are rather cuddly and fun-looking. Sometimes, cartoon-style slots can leave you wanting more in the way of good graphics. 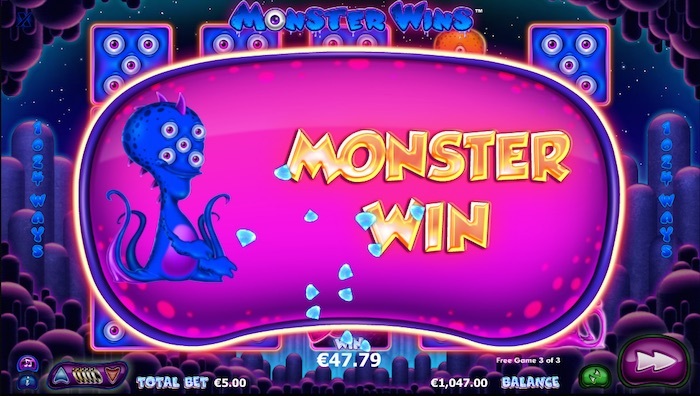 We didn’t get that feeling here though, as the NextGen Monster Wins online slot delivers colourful monsters of all shapes and sizes. It also takes place in front of a background with real depth in various shades of blue, which is rather nice. As for playability, it’s great – very good indeed. Everything is lovely and clear without being hard on the eyes, and the symbols move to indicate winning lines when you get them. If you squint, you’ll see a tiny (and we mean tiny – or do we just need new glasses?) ‘i’ in the bottom left of your screen. Click on that and you’ll be taken into a pay table that has four pages filled with information. Here you’ll find out more about the special symbols (there is a wild and a bonus scatter involved) as well as the regular ones. The five-eyed symbol is the best-value regular one, providing 100 coins for five on a line. You’ve also got four larger monsters and five smaller ones, and the larger ones deliver bigger prizes for three or more on a relevant ‘way to win’ line. One final tip here – when you reach the final page of the pay table, labelled ‘rules’, make sure you scroll down. It’s easy to miss the extra info included there if you don’t. The Monster Wins slot has a number of features worth noting if you’re intending to have a go at this slot from NextGen Gaming. Firstly, the wild is very easy to see because it says just that. It can show up on any reel except for the first one. It also has the usual rule attached to it in that it can replace everything else you see apart from the scatter, which we’ll come to in a moment. Similar to the wild, the scatter consists of a word, but not scatter. Instead, it says bonus. Get at least three of these and you’ll get three Boss Monster free games. The entire first reel is made up of Boss Monsters when these free games begin. The other main feature is called Unleash the Boss Monster. You can also get a stack of Boss Monsters on the first reel in regular games. If you do, you’ll get more Boss Monster symbols appearing on the other reels to trigger further wins. This can vastly increase the odds of racking up a seriously good win in just one spin, from several winning combinations appearing at the same time. The pay table shows you how this can happen, so you will know what to look for. It’s not always easy to tell how much you can bet on a game that doesn’t have a set number of paylines. So it’s good to know you can enjoy a spin on the NextGen Gaming Monster Wins game from just 50p a go. It’s also possible to go up through several other betting amounts, all the way up to £100. It basically assumes coin values from a penny to £2 and multiplies that amount by 50 to get your total bet. The pay table reveals the RTP as 97.12% overall. The highest prize you could win would be 2,500 coins if you get five Bonus scatters on the screen. However, in theory you could win more than that if you got a Boss Monster stack on the first reel and lots of additional Boss Monsters appeared to trigger more wins. Even though the Monster Wins slot is new, you shouldn’t have much trouble finding it at a variety of UK slots sites. You’ll want to play it too, because it looks good, works well and is great fun. And isn’t that just about everything a good online slot should be?